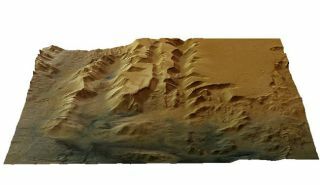 3-D Digital Terrain Model of the Ius Chasma, using data from the High Resolution Stereo Camera. The towering3-D features of Martian canyons and highlands are about to stand out like neverbefore, thanks to data from a high-resolution camera on the Mars Express orbiter. These data,collected by the camera on the European Space Agency's MarsExpress, are allowing scientists to create so-called Digital Terrain Models(DTMs) to look around the Martian surface from differentdirections and angles, as opposed to the usual bird's-eye view from aboveprovided by previous Mars orbiter cameras. The new data sets have now beenreleased on the Internet, the European Space Agency announced this week. ?Understandingthe topography of Mars is essential to understanding its geology,? said GerhardNeukum, HRSC lead scientist at Freie Universit?t (FU) in Berlin, Germany. Creating thedata for such digital models requires spacecraft to study the same Martianfeature at least twice, each time from a different angle. Most previous effortsto do this have involved spacecraft making two orbital passes over features. The Mars Express High Resolution Stereo Camera (HRSC) onlyneeds one overhead pass to capture images of a feature from three differentangles ? on approach, directly underneath and receding into the distance. Thecamera also obtains altitude measurements for its high-resolution images. All thatdata is processed by the German Space Agency (DLR) and FU Berlin for severalyears before digital models of the Martian surface can start to emerge. Now researchersare selecting the best data to "stitch them together" and develop digitalmodels on a "global scale," Fred Jansen, Mars Express senior manager,told SPACE.com. The newlyreleased DTMs allow researchers to instantly gauge the slope of hillsides orthe height of cliffs, as well as the altitude and slope of lava flows or desertplains. ?This datais essential for understanding how water or lava flowed across Mars,? Neukumsaid. It alsohelps planetary scientists better interpret Martian data from other instrumentsand missions, such as the MarsAdvanced Radar for Subsurface and Ionosphere Sounding. ?Once weknow where the surface is, we can correctly interpret the radar echoes we getfrom below it,? said Angelo Rossi, HRSC scientist. Lowerorbits of Mars Express allow for more detailed pictures. The Mars Expressmission will continue collecting such data until at least 2009.